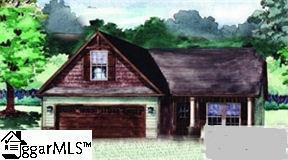 This home is a 3 bedroom 2 bathroom home with a bonus room above the garage. The master bedroom offers tray ceiling with ceiling fan and walk in closet. The master bathroom offers double sinks, separate tub and shower. The kitchen offers upgraded 42" showcase style cabinets with crown molding. Other upgrades include crawl space with 12x12 deck, upgraded paint and windows, fireplace, finished bonus room, and much more. This area now qualifies for USDA. Listing provided courtesy of Julie Landrith of Jubilee Realty, Llc.